DAC Beachcroft's real estate team has sponsored Bisnow's State of the Market conference. The event took place on the fifth floor of 22 Bishopsgate, which is a building site, and the speakers were accompanied by intermittent drilling noise! That said, it was fascinating to visit such a high profile, innovative development and hear first hand from some of the people involved in the construction of this "smart building". 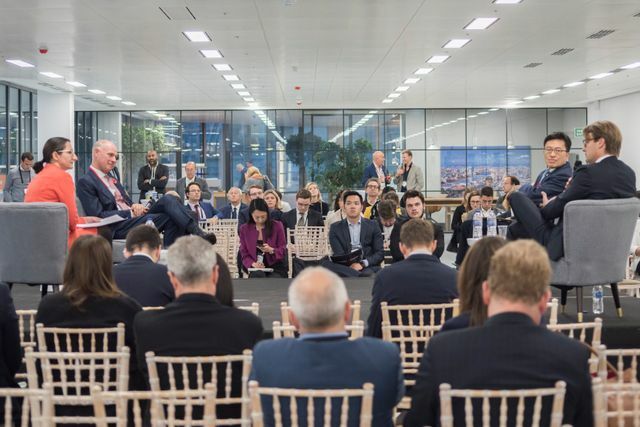 Although it was clear from the speakers that Brexit is a concern for many in the UK real estate market, the topics which most dominated the six panel discussions were technology and talent (more on this below). The final session of the day was a panel discussion, moderated by me, on the forecast for global real estate investment in 2019. My panellists, chosen to represent an Asian perspective (Collin Lau, Founder of Bei Capital), a European perspective (Mathieu Elshout, Senior Director Private Real Estate, PGGM) and a UK perspective (Chris Taylor, CEO, Hermes Investment Managers) talked about some of the global megatrends they see impacting the way we invest in real estate in 2019 and beyond: the increasing importance of sustainability as an investment criteria; changing shopping habits leading to less demand for traditional retail real estate and a growth in demand for logistics; a continuing wall of money from Asia seeking secure investments across the world. In a session on Built to Rent schemes, James Seppala, Head of Europe at Blackstone, talked about the wealth of data Blackstone has from customer (customer, not tenant) surveys at multi-family units in the US and how that data is used to adjust their offering, lowering tenant churn and maximising rents. In a session on smart buildings, Harry Badham, UK Head of Development at AXA IM, told us how AXA has partnered with Microsoft to deliver an innovative office environment at 22 Bishopsgate. In a session on tech disruptors, Patrick Weiss, Property Acquisitions Manager at Deliveroo, talked about how Deliveroo's "dark kitchens" are lowering barriers to entry to the food delivery market as new chefs can get access to a fully fitted kitchen at no cost (Deliveroo take a slice of the business's revenues) and without needing a high street presence. Jules Pipe, Deputy Mayor for Planning, Regeneration and Skills was concerned about the skills deficit in our nation's school leavers. But Kathryn Harrison, Managing Director at Deutsche Bank, highlighted the breadth of talent in the UK jobs market as one of the reasons why the UK and London will remain a key hub for Deutsche Bank. In a session on the future of urban mobility, Lilli Matson, Head of Strategy and Outcome Planning at TFL, told us that demand for metro travel is softening worldwide as working patterns become more flexible and agile, but the panel recognised the need for a diverse and efficient transport offering to bring in talent from locations ever further away from the centre. Eugenie Teasley, Head of Cities, South & East of England, at UBER, talked about how UBER complements public transport in locations and at times of day which are less well served by public transport. Two senior voices in the real estate industry, Alison Nimmo, CEO at The Crown Estate, and Chris Grigg, CEO at British Land, celebrated how the real estate industry has become more diverse during their careers, but stressed how much more there is to be done to encourage the very best talent to progress in an interview discussing the importance of hiring great people. Thanks to Bisnow for organising such a great event! Photo courtesy of Peter Ritson. @BisnowEurope Chris Taylor of Hermes Investment Management "hugely excited at the prospect of the #realestate industry being the conduit for social mobility, productivity and economic growth."